From the roof to the basement to the garage, there are many things that go into your home insurance rate. And, just like auto insurance, home insurance rates can vary wildly between providers for the same home. But what specifically affects your home insurance rate? 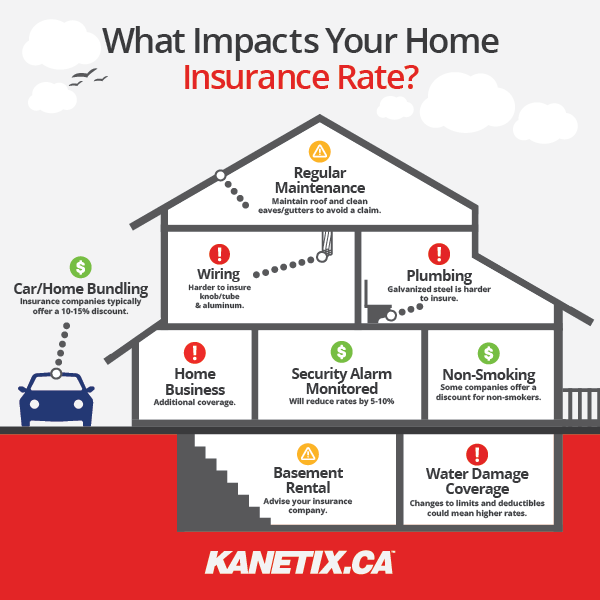 As you make your house your home, we've identified 21 things that may influence the rate you pay for your home insurance coverage, and illustrated a few of them in this Kanetix.ca infographic. So these are a few of the factors that will affect your home insurance rate. But what doesn't affect it? You may be surprised. What doesn't typically affect your home insurance rate? There are a few home insurance myths that lead people astray when it comes to home insurance, and the following are just a few as it relates to what goes into your premium. Gas appliances, like stoves and dryers, are generally treated no differently from a home insurance standpoint than electric appliances. Whether you've got one child or 10 little ones living with you, the number of children you have will not affect your home insurance rate. When it comes to home insurance, your marital status or age is typically not a factor, although this may vary by home insurance provider illustrating why it's important to shop around for the best price. How much you owe on your mortgage is also not a factor. It doesn't matter if you owe $50,000 or $500,000 your home insurance rate will be the same. However, if you're mortgage-free you could qualify for a discount that could be as much as 15 per cent. On the flipside, if you have multiple mortgages on the same property, this could increase what you pay for coverage. The market value of your home is not a consideration when it comes to your home insurance rate. A home is insured, not for its market value, but the cost to rebuild it. Market value takes into consideration things like location, land value and "comparables" (how much similar homes sell for in the neighbourhood), whereas rebuild value focuses on what it would take to rebuild and duplicate your home; materials, labour, permits etc. While these five factors don't typically affect your home insurance rate, one that will affect what you pay for coverage is shopping around. Spend less on your home insurance and compare home insurance quotes today in minutes and find out how much you could be saving! Our service is absolutely free and you won't get a cheaper price by going direct.